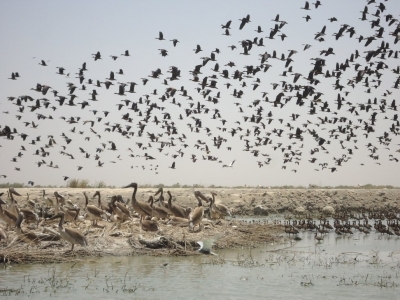 Djoudj National Bird Sanctuary covers wetlands habitats that are staging and wintering areas for migrating birds which have just crossed the Sahara. From September to April, an estimated three million migrants pass through, joining a dense population of resident breeding birds. Of almost 400 species of birds, the most visible are pelicans and flamingos. Less conspicuous are the Aquatic Warblers migrating here from Europe; for these, the park is the single most important wintering site yet discovered. A wide range of other wildlife also inhabits the park. This includes jackals, crocodiles, gazelles and manatee. Site visited recently (April, 2018). It is one of those places that are easier to visit with an organised tour than alone mostly due to cost reason. If want to visit the place independently (which I did) you shoul be prepared for some huge costs. First of all is transportation - as it is around 60 km from Saint Louis town (25 km is a good asphalted road, while the rest is on dirt, local, not necessarily 4x4). The costs for this part (including waiting time in the park) is 25.000 CFA (unfortunately this amount is stated in Lonely Planet guidebook as an indicator, so it is quite difficult to negotiate the price but anyway try). At the park entrance you have official state prices for everything: guide (obligatory, although only French speaking) 6.000 CFA per group, boat trip 4.000 CFA per group, entrance fee per person 5.000 CFA, entrance fee for the car 10.000 CFA. So as you see depending on the number of people the trip may be somehow expensive. To reduce costs a little bit you can skip the boat trip and go for walking in the park but that is not recommended as the boat trip is the most interesting part of park visiting. The most important areas are those at the end of boat trip where the majority of migrating birds are located. View of thousands of pelicans, herons, egrets, cormorants is truelly amazing. Acording to guide's information the best time to visit the park is winter (December to March) and the beginning of spring (until May) - while the birds are staying there. Comparing all UNESCO Heritage Sites in Senegal I found Djoudj as one of the most interesting mainly due to the large number of birds (and other mammals - warthogs, monkeys) and relatively less rubbish (especially in relation to Saint Louis island). 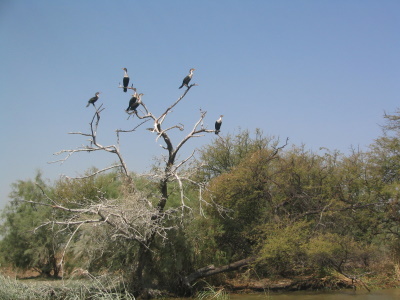 Djoudj National Park is famous for its birds. I visited the park in april 2014 and a lot of birds still were there; we did it with a day trip from ST. Louis. Than we did a three hour boat trip on the water. Besides birds we saw warthogs, varanes and crocodiles. After that we did a trip with our bus to look for more birds from lookouts, but this was a disappointment.